See the series "Les dossiers thématiques d'Agropolis International"
See the seriesf "Les dossiers thématiques d'Agropolis International"
Home > Publications >Thematic directories "Les Dossier d'Agropolis International"
Electronic portal on the research on crops and cropping systems, a key area of excellence of the Agropolis International scientific community. 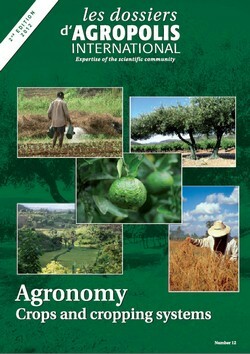 The series is a publication issued by Agropolis International, in French and English, within its mission for the promotion of the scientific community skills. Each series which is a directory of skills, is dedicated to a major scientific issue. The data related to the research units have been updated on 07/12. The other information presented was valid on 30/05/10. 300 researchers and teacher-researchers, supervising around a hundred PhD students. • 80 diploma courses (from Bac +2 to Bac +8: technician, engineering degree, Master’s, PhD), as well as vocational training modules (existing or developed upon request). These thematic directories provide a global and easy to consult presentation of the laboratories, teams and research units of all the Agropolis intitutes involved in the given issue. They also provide information on the wide range of training sessions available. One of the objectives of the series is to facilitate contacts for the development of exchanges and technical and scientific cooperations by a wider promotion of the community skills.